RVs mixed with trucks in the back part of the lot, More truck traffic than most casinos. No way to get to non-smoking section without going through the smoke. Good burger in cafe, but service was a bit slow. Security check-in, then take approval notice to Player’s Club desk, show ID again, get a Players Club Card and return to Security for a final signature. 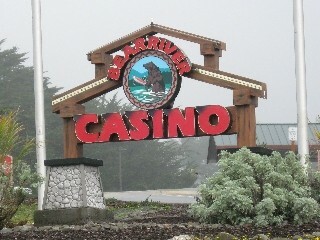 Bear River is a good location from which to set off and explore the rest of the coast. One passes into Oregon after half a day, not that that makes any difference as the roads are equally serpentine and the views just as impressive (once the fog lifts). 7/28/15. Easy access off the highway. Has good signs showing RVs where to go. 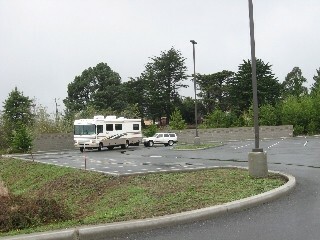 The lot has no RV specific spots, its just a typical side lot for extra car parking. Lot is very level. Didn't see any water supply. The casino is quite nice. The machines are state of the art. The only video blackjack is in the bar. Players club card gives $5 of free play with no other perks. 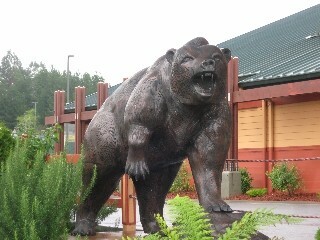 Very friendly security and nice level paved parking lot. We stopped for one night and ended up staying two. Nice location for a scenic drive. We registered with security and signed up for Player Passes. Not only did they give us $10 each, since it was husband's birthday month, they gave him an extra $50 to be played over three days.